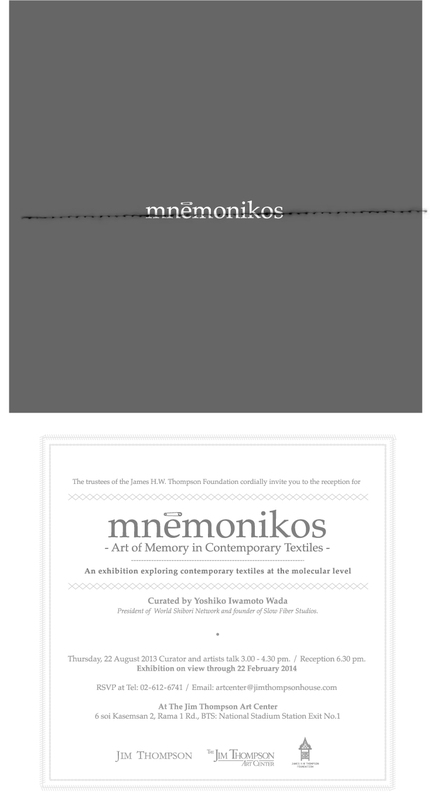 The Jim Thompson Art Center will be opening it’s show; Mnemonikos: Art of Memory in Contemporary Textiles , this Wednesday in Bangkok, curated by World Shibori Network President and Slow Fiber Studios founder, Yoshiko Iwamoto Wada. painting, and dyeing; cutting and tearing; sewing and embellishing. the perspectives of all those involved in their genesis and transformation. knowledge, and vision, thus revealing the memory embedded in it. president of World Shibori Network and founder of Slow Fiber Studios. The gallery is beautifully designed by allzone Co. ltd.
For more information and calendar of exhibition events and workshops, visit the Jim Thompson Art Center online. This entry was posted on 17 August 2013 by World Shibori Network.